When I was about nine, my neighbors got stationed in Japan and rented out their house, as military families often do. I was devastated, as their little boy and girl were like my siblings and taught me how to scream, “MOM!! They are touching my stuff,” with all the righteous indignation of an older sister. (Seriously. They would not leave my Barbies ALONE.) However, this pain was eased a few months later when my friend Tal’s family moved in next door. I first met Tal when she was locked out of her house after school one day and was sitting outside. Not being a latch-key kid, I was fascinated—she got to stay at home all BY HERSELF? She seemed super mature, so of course I invited her over to come play. She played Barbies like a pro, read as many books as I did and owned an eight foot tall book shelf covered in the most My Little Ponies I’d ever seen in my life. Plus, she had a younger brother and sister we could boss around. We became fast friends. I bring all this up to point out that one thing made my sophisticated friend lose her mind a bit, and it was my mom’s creamed chicken and biscuits. 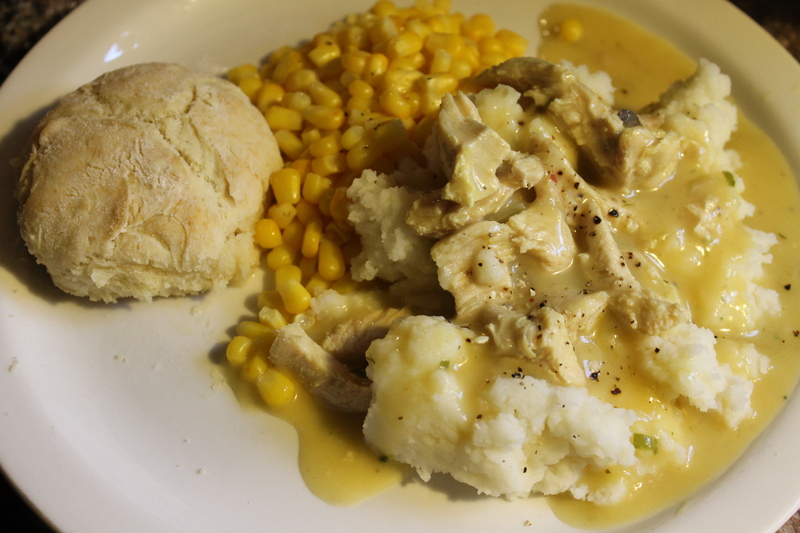 Technically, it’s my grandmother’s creamed chicken and biscuits, but it is a tasty stick-to-your-ribs meal that we almost always had to have when Tal spent the night, which was often. I don’t know that it was the creamed chicken that she loved as much as it was the biscuits. And the love she had for those biscuits was DEEP. Now, due to the military, my dad wasn’t always around but when he was he delighted in messing with Tal and I. Whether it was turning the channel when we were watching Mannequin for the 18th time or threatening to feed our Barbies to the family dog, my dad was like having an obnoxious big brother who could ground you. It was on one of these evenings home that my father walked into the kitchen as we were eating creamed chicken and biscuits. Tal and I both had full plates, but there was one biscuit left and she had already laid claim to it. I knew better than to challenge this, as she was a guest-and she was small but feisty. My dad, who had already eaten, walked in and then tried to snag the last biscuit. Tal protested, Dad argued and they mildly bickered over who was most deserving of the bread-y goodness. Dad had put the biscuit back and was about to leave the room when suddenly he turned around, snagged the biscuit and proceeded to lick it and put it back on the plate. Tal was shocked, my mother was horrified and I laughed so hard I nearly wet myself. The biscuit remained my father’s, and though Tal has not lived close to us in nearly 20 years, this is a story that gets brought up every time she is around my father. She’s still upset about losing that biscuit. Anyone else have any favorite friend meals? Either made by you or family for your friends, or a meal that you love made by friends or friends’ parents? Everything tastes better when someone else makes it, and even better when the person making it calls you sweetie and asks you if you want a juice box. Boil any part of chicken you prefer (Mom buys whole chickens and skins them and cuts them into pieces) in a stock pot with just enough water to cover them. Salt and pepper the water if you wish; my grandmother throws in celery stalks or celery seed for flavor. If using stalks, remove them when done. Save the broth from chicken and put aside. Shred the chicken, remove bones, put back into broth. As my mom says, “From here, you can cheat and add a couple cans of cream of chicken soup, or cream of celery or cream of mushroom. Or you can do what my mom does; she makes a flour and water slurry and whisks that into the broth.” If using cans, think about one can per pound of chicken. If using flour and water slurry, use 3/4 water to 1/4 cup of flour. You can also do half water/half milk, to make it extra creamy. Mom missed this step (You see what I’m working with here?!?) but cook the chicken and cream broth until it thickens, stirring often. The consistency will remain fairly thin, so do not overcook. Also, if you prefer big chunks of chicken, be careful when stirring to not break up it up too much. Season with a little salt and fresh ground pepper. Serve over mashed potatoes, rice or egg noodles. Combine all ingredients, save the shortening/butter. Cut in shortening, using your hands or a pastry blender. Knead just enough to mix everything together; over kneading makes for tough biscuits and a sad Tal. Roll out on floured board to desired thickness, cut with bottom of glass or round cookie cutter. Alternately, you can drop these onto a cookie sheet, or put into a muffin tin. Whichever you choose, make sure to grease a little with butter, shortening or a shot of cooking spray. Bake in 450 oven between 12-15 minutes, taking out when a nice golden brown. Every time a blog post by you comes up in my reader I am overjoyed. That is all. LOL and awww, I didn’t realize the impact my little brats leaving had on you! I can personally testify, Ms Carol is a beast in the kitchen, I always knew if I wanted pie, hop over next door. Thoroughly enjoyed the story (yep, that’s David) and will definitely try the recipes.